A ship headed to Australia carrying 260 asylum seekers was intercepted in Indonesian waters in early October 2009. The ship was then diverted back to Indonesia, but those on board refused to get off the vessel. In recent days the asylum seekers have threatened to blow their ship up unless they were escorted to Australia. When that didn't work they went on a hunger strike. They did not want to set foot on Indonesian soil where their cases would take several years to be heard by the UNHCR. The Australian government refused to budge on it's stance. The Asylum seekers were intercepted in Indonesian waters and Kevin Rudd the Australian PM wanted Indonesia to deal with the issue. Video: 250 Tamil asylum seekers on hunger strike, Rudd refuses to budge, Sri Lanka doubts they are even refugees. The Australian media was allowed to interview the asylum seekers. From the 260 on board a man calling himself 'Alex' was appointed to speak to the media. That's when the Sri Lankan bashing began. The asylum seekers fed the naive Australians everything they wanted to hear. They said they feared being raped, killed and tortured if returned to Sri Lanka. The asylum seekers told the gullible Australians that Tamils were being persecuted in Sri Lanka. David Feith writing for the Sydney Morning Herald went out on a limb to display his ignorance to us Sri Lankans. David wrote, "It is the extreme, so-called "push factors" and the entrenched discrimination against Tamils in Sri Lanka that leads to desperate acts, such as embarking on a dangerous voyage on unsafe vessels." As the weeks rolled on more and more of the asylum seekers lies began to unravel. Initially they claimed to have been living in the jungles of Sri Lanka after fleeing camps. It was later revealed that these asylum seekers had been in Indonesia for 5 years. 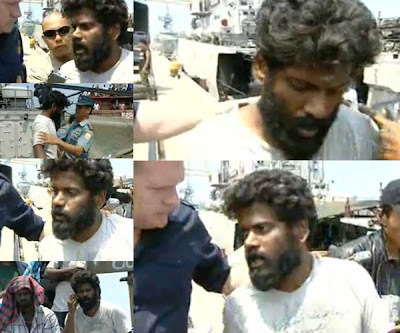 Now 'Alex' the spokesman has been identified as Kulaendrarajah Sanjeev, a known human smuggler who was deported from Canada in 2003. "Alex had been involved in human smuggling for a long time and it is believed that his office is based in India," the statement said. "His brother who is now in Canada is also involved in human smuggling" and is being sought by Canadian police, the statement added. Meanwhile in Canada two Tamil Tiger combatants have already been identified on the ship that arrived there. Tamil Tiger fronts in Canada masking themselves as Tamil community organisations have tried desperately to free the 76 asylum seekers who happen to be all men. The Canadian government has utilised the expertise of Professor Rohan Gunaratna, a renowned terrorism expert from Singapore, to assist them in identifying the men that arrived on it's shores. Tamil Tiger publications in Canada have attempted to defame Professor Gunaratna and question his credibility. A sign perhaps of how important these 76 asylum seekers are to the Tamil Tigers in Canada. For the record the following is Professor Rohan Gunaratna's credentials and accomplishments. *Head of RSIS’s International Centre for Political Violence and Terrorism Research (ICPVTR). *Member of the Steering Committee of George Washington University's Homeland Security Policy Institute. *Senior Fellow both at Fletcher School for Law and Diplomacy's Jebsen Centre for Counter Terrorism Studies and the Memorial Institute for the Prevention of Terrorism, Oklahoma. * Counter terrorism instructor for GIGN, CTSO, D88, US NAVY SEALS, Swiss Federal Police, NYPD, and the Australian Federal Police. *Former Senior Fellow at the United States Military Academy's Combating Terrorism Centre at West Point. *Litigation consultant to the U.S. Department of Justice, expert in the Jose Padilla trial. *Author and editor of 12 books including “Inside Al Qaeda: Global Network of Terror” (Columbia University Press), an international bestseller, Gunaratna is also the lead author of Jane’s Counter Terrorism, a handbook for counter terrorism practitioners. His latest book with Michael Chandler, former Chairman of the UN Monitoring Group into the Mobility, Weapons and Finance is "Countering Terrorism: Can We Meet the Threat of Global Violence?” He also serves on the editorial boards of "Studies in Conflict and Terrorism" and "Terrorism and Political Violence," the leading academic journals in the field. It doesn't take much to realise that those who question Gunaratna's credibility or qualifications are the lawyers whose clients are on the receiving end of Gunaratna's testimony and the terrorist themselves.